Thayne-san, today we’ll be visiting a sukiyaki restaurant in Asakusa called Chinya, which was established in the 13th year of the Meiji Period (1880). Thayne-san, thanks for coming. I’m Sumiyoshi. Hello, Sumiyoshi-san. What an incredible location―only ten seconds from Kaminarimon! Yes, we’re very fortunate. We’ve been here since we were first established. I’m sure you get a lot of tourists in addition to your regular customers. That’s right, we get tourists from all over Japan as well as abroad. Naturally this includes a lot of American customers. That’s because Americans all like sukiyaki. I don’t know anyone who doesn’t. But I’m glad I didn’t come here for my first sukiyaki in Japan. If I had tasted the delicious beef you use here, I wouldn’t be able to enjoy any of the regular beef bowl franchise places. Does your secret lie in using higher quality beef? We only use beef from heifer cows of the Japanese Black (kuroge wagyu) breed, and only the really flavorful beef from cows fattened for about 30 months. On top of that, we let the beef age for an additional month before using it in the restaurant. Aging makes the beef more tender and adds flavor. But Thayne-san, it’s more than just the beef. The warishita (soy sauce-based broth) is also really important. Even with the highest quality beef, you need good flavoring. That’s right. 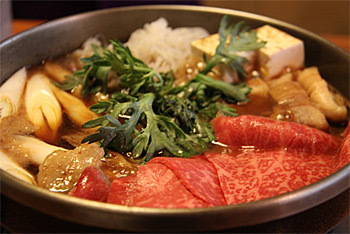 Chinya sukiyaki isn’t Chinya sukiyaki without warishita. 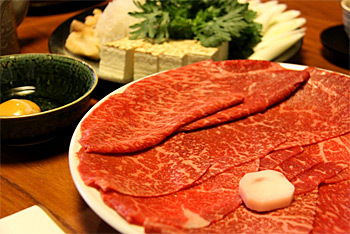 Both our beef and our warishita are for sale here, but people who buy just the warishita to make sukiyaki at home have told us it’s not quite the same. Unfortunately, there’s not much we can say, because our warishita is made to go with our beef. I see. You have to buy the beef together with the warishita. By the way, your restaurant has a wonderful atmosphere. Although it’s in a building, it feels like we’re in an old Japanese home. I really love your collection of wood block prints hanging in the booths and hallway. And you don’t need your own Japanese garden since the Sensoji temple grounds are in your backyard! Yes, that’s right, you have Sensoji instead! Praying at the temple, walking around the grounds, and strolling along the Nakamise shopping street, followed by sukiyaki at your restaurant―that would make for a great day. So it’s been over 130 years since your shop opened. Tell me, what’s your secret for such long-lasting success? Well, let me see… Of course, serving excellent sukiyaki to customers generation after generation is the number one foundation for our success, but there’s one other thing. That’s the fact that we haven’t failed to understand what our true assets are. Your “assets?” What do you mean? By assets, of course, I don’t mean savings. If we simply wanted to make money, we would have filled the restaurant with tables and not have built a tatami room. I don’t mean our land or the building itself, either. Asakusa was destroyed by fire after the Great Kanto Earthquake, and it was destroyed again during the War. Both times we lost everything. So I definitely don’t consider those things our “assets.” What’s important is the people. Some of our customers have been coming for generations. Just the other day I felt moved by the words of one customer who said she was the fifth generation in her family to patronize our restaurant. Another customer told me that when he was sick in the hospital, he promised himself that when he overcame his illness and was released, he would come here. Those kinds of customers are our true assets. Staff who relay those kinds of customer stories to me―they are Chinya’s assets as well. They’re the kind of people who are happy to see our customers happy, who take pride in our restaurant and feel good about working here. 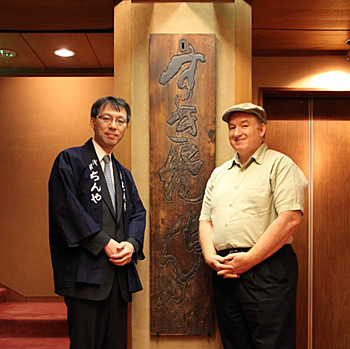 Asakusa is just the place I might expect to hear heartwarming stories like that. Thank you. But you know, they also say people from Asakusa are a little exclusive and hard to approach. Now that you mention it, watching the Sanja Festival, the locals seem very close knit. I can imagine it would be hard to join in. In any case, the friends I grew up with―friends I’ve known since kindergarten, elementary school, junior high―are now festival organizers, community association members, union members, and so on. Our relationships tend to go on forever. Ha ha…that sounds like the relationships typical of old shitamachi part of Tokyo. Listening to you has given me a glimpse of the non-touristy side of Asakusa. Actually, we’ve been talking about ways to make it easier for tourists to spend the night here so they can continue to enjoy Asakusa after the sun goes down. Rather than heading back to a hotel in Ginza or Shinjuku, we want them to take their time here, and get to know more of Asakusa’s charm. That’s a great idea. Asakusa at night! Come to think of it I’ve always been here during the daytime as well. Next time maybe I’ll visit at night.